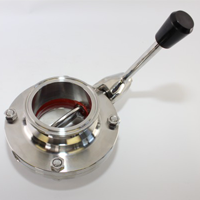 The Manual Betterfly Valve is entirely stainless steel and designed to fit where space is short, it is available with clamp, weld-on or bevel-seat ends. It is a complete valve unit - ready to install in your pipeline. The valve features a heavy-duty, highly elastic seat is held firmly and compressed by the two halves of the valve body that forms a tight seal around the shaft, preventing leakage along the stem.